Pick up 09:00 – 09:30 from the hotel and transfer to eco camp for light breakfast. Take pictures with monkeys. 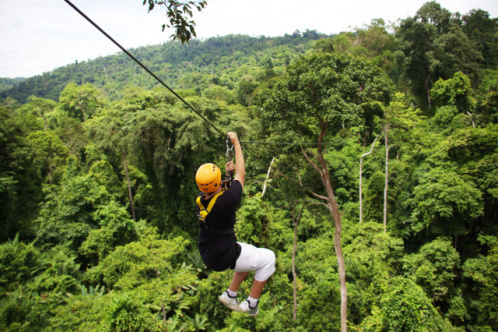 Your choice of exciting canopy zipline, Muay Thai training, archery or elephant trekking and Zorb Balls or Bunjee Ejector. Visit Phaeng Waterfall and the Dome Sila viewpoint. Thai Buffet Lunch. Snorkel at Koh Ma. Then to the floating water park and 2 slip and slides at Water World. Return to hotel about 16:00 – 17:00. Pick up about 10:30-10:45 from hotel. 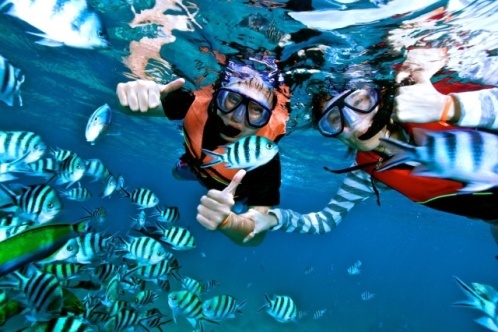 Snorkel at all the best spots on Koh Phangan! 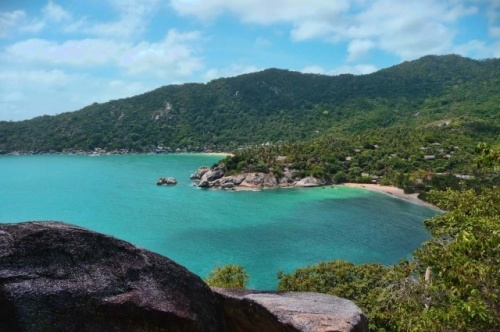 Start at Haad Salad, then Koh Ma and Haad Khom, visit Thong Nai Pan for lunch, and head back to Bottle Beach for relaxing and swimming. Trip includes round trip hotel transfer, snorkel equipment, and lunch. Pick up 11:00 – 11:45 from the hotel. 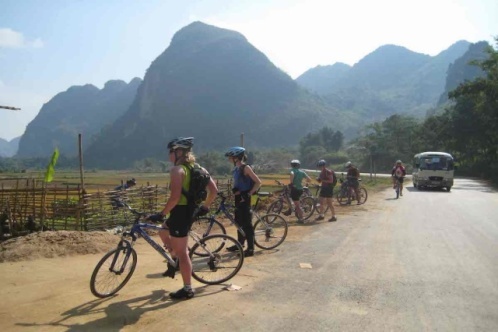 Our most popular bicycle tour is a gentle sightseeing ride with plenty of stops and sights that gives you an insight of the local life on Koh Phangan. Time: 08:45 – 13:15. Distance: 19 KM. Terrain: Paved roads, countryside, dirt track, jungle trails. Sights: Coconut Processing Plant, Rubber Tree Plantation, Temple/Viewpoint, Phangan Animal Care, Fresh Food Market. Includes round trip hotel transfers, Fruits & Snacks, Soft Drinks, Bicycle. This fun ride is tailor made for the entire family. 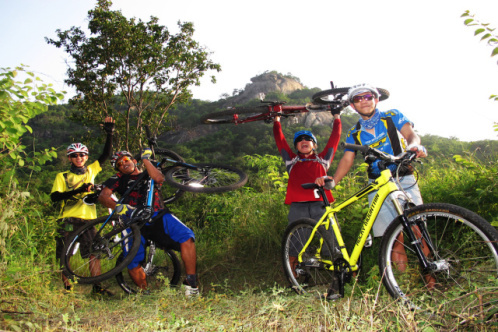 An easy ride on quiet roads combined with interesting sites, ensures a memorable experience for all ages. Terrain: Paved Roads, Countryside, Jungle Trails. Sights: Government School, Temple/Viewpoint, Local Herb Garden, Police Station, Roadside Restaurant, Fresh food market. 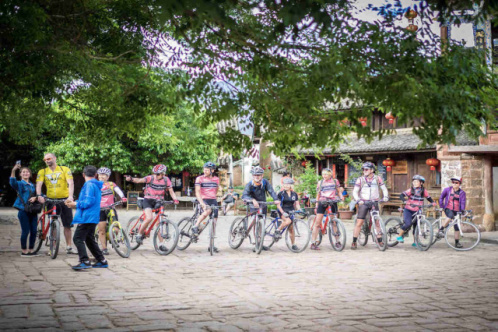 Less paved roads and spectacular scenery combined with “secret” jungle trails makes this tour an adventurous culinary experience. Time: 15:00 – 19:30; Distance: 18 KM. Sights: Cocount Pricessing Plant, Rubber Tree Plantation, Temple/Viewpoint, Local Herb Garden, Police Station, Night Food Market. A unique opportunity to explore the archipelago of 42 tropical islands. 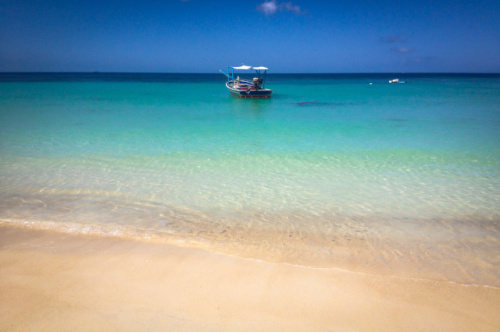 Cruise off the shores in a speedboat, visiting beaches, viewpoints and snorkel sites. A full day visiting Thailand’s “must see” destination. Tour includes round trip hotel transfers, all snorkel equipment, light breakfast, buffet lunch, and English speaking tor guide. ***Note: 300 baht park entrance fee is NOT included. 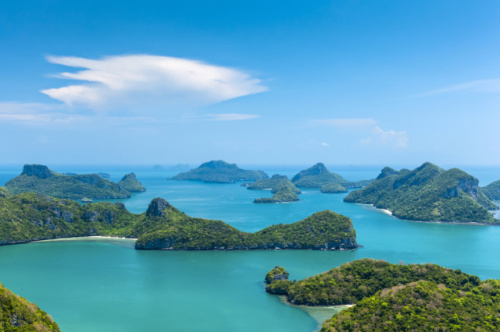 Visit Angthong National Marine Park on Orion’s famous wooden boat, complete with water slide! Explore the beautiful beaches, viewpoints and snorkel sites on this untouched tropical paradise. Tour includes round trip hotel transfers, all snorkel equipment, light breakfast, buffet lunch, and English speaking tor guide. ***Note: 300 baht park entrance fee not included. 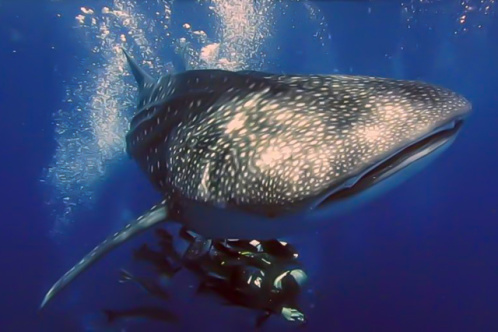 Discover the secret beauty , unique under water wildlife and tranquility of one of the world’s most beautiful islands! ***Note: 100 baht park entrance fee not included. For beginners or experienced wake boarders. 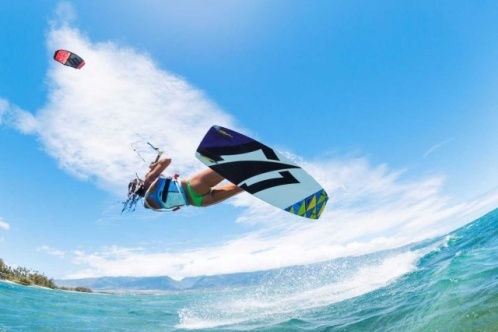 Simply the best way to discover kite surfing! This is for people who want to learn what kite surfing is about and get a taste for kite flying. This course is also part of the 3 day intermediate course. The first part of this program will take you though the steps of setting up and flying a kite with trainer lines. You will gain an understanding of the wind window, so you will know where you can and cannot fly the kite in relation to where your standing and the wind direction. Inside this window are the “power zones” , you will learn where they are and when to use them. Selecting the right spot for kite boarding and kite flying with the associated hazards in mind is important. The weather, how to predict it and how it can change in different parts of the world allows you to plan kite boarding trips and keeps you aware of potentially dangerous weather situations. Knowledge of tides are important as the water can move in and out during the day, rips or underwater currents can be a factor on some coastlines. The kite comes with safety systems. It’s a must to understand how to deploy these in different circumstances and how to check they are working before launch. Includes all equipment, instructor and course material. This course is for people who want a kite boarding course that’s going to give them all the skills and knowledge for board riding. The last day focus’s on the water start, there’s nothing like your first board ride! The first part of the 3 day kite surfing course, you will learn how to walk to and from the water with the kite flying. You will then learn how to re-launch the kite from the water surface. The next part is very exciting as you will feel the power of the kite as it drags you through the water. Once you have these flying skills in the water, it’s time to practice self-rescue techniques and a complete pack down. Body dragging upwind will give you the ability to pick up a board which is upwind of your position. Next you will learn the theory behind the water start. And now the point you have been working towards, “its time to put a board on your feet!” And set up for a water start. This is a great way to see if diving is right for you! Three to Four day course for Open Water certification. Light breakfast and buffet lunch included on all boat dives. Includes round trip hotel transfers on all days, certified instructor, course material, light breakfast and lunch each day. 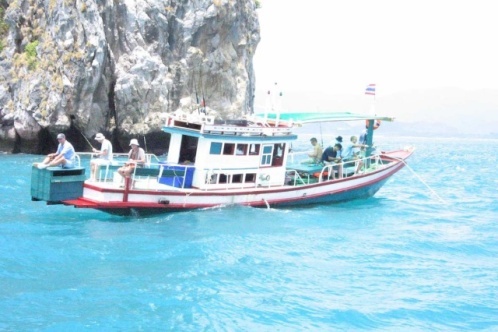 Enjoy a private tour in a Thai Long Tail Boat around the majestic island of Koh Phangan. 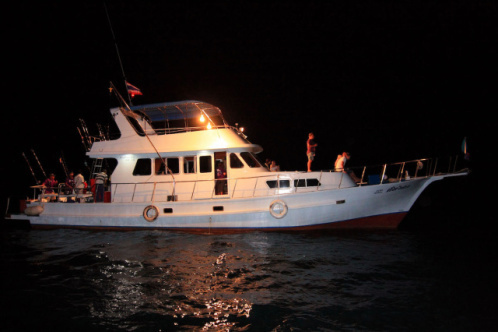 Includes round trip hotel transfers and boat for about 8 hours and approximately 4 stops of your choice. Times are fairly flexible but are dependent on tides. 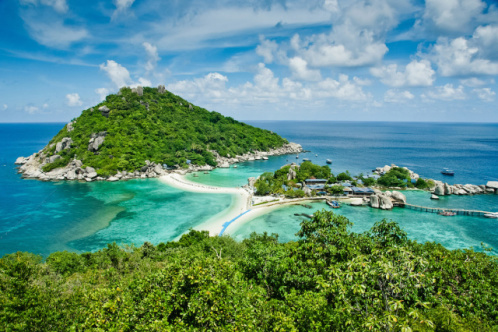 Take a private speedboat to the beautiful island of Koh Tao. Includes round trip hotel transfer and guided tour. Take a private tour of the stunning archipelago of Angthong Marine Park with Orion’s famous wooden boat complete with water slides! Entrance fee of 300 THB per person not included. Enjoy a tour of Angthong Marine Park in style with a private speedboat. 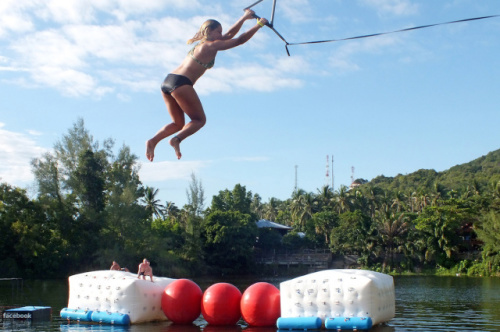 The Challenge Phangan: Koh Phangan’s obstacle course on the lake! The Challenge Phangan is the legendary adventure obstacle course on water. Test your skills and see how quickly you can complete the tricky and exhilarating course. Comprising of rope swing, stepping stones, monkey bars, rolling barrels, climbing mountain, slide and the infamous big red balls. Beat the clock and earn yourself a place in the Phangan Wipeout leader board wall of fame! After a workout, take a break; fill up in the restaurant, and try out the hearty new menu. Happy hour everyday between 4pm-6pm. Anyone under the age of 18 must wear a life jacket. Children under the age of 10 must be accompanied by an adult at all times. 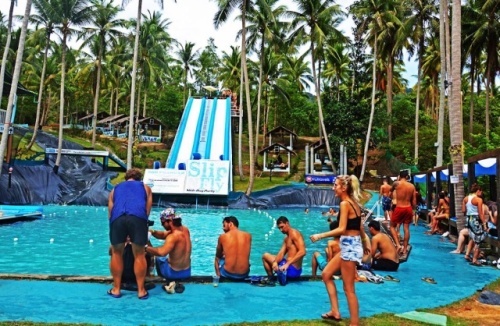 Slip n’ Fly Day Party: Test your courage with these water slides! The number 1 daytime party to hit Koh Phangan Island. Featuring two water slides, swimming pool and prize giveaways. 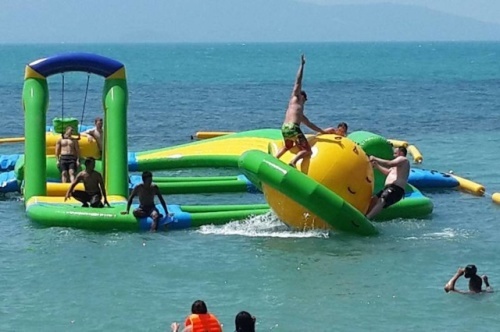 WaterWorld Koh Pha Ngan is the island Newest largest attraction . If you are looking for something to do for a day or two come on down to Haad Rin and spend some time here. With a bungee ejector, floating water park, zorb balls, two huge slides, a gyroscope and a gladiator arena, plus a children’s area with bungee trampolines, bouncy castles and children’s slides there is something to do for all age groups.